Description: This oil on linen canvas painting was based upon the many old houses built into hillsides and known as bank houses. 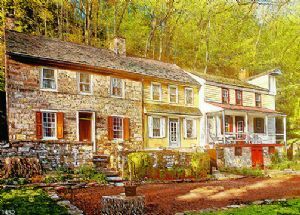 An ancient house similar to this once stood close to the banks of the Delaware River, set into a steep hillside not far from Frenchtown. Also available as a unique signed limited edition archival giclee on canvas embellished in oil starting at $219.00, depending on size. Tom Jewusiak has been a working professional painter all of his adult life. He worked his way through college (he is a graduate of Fordham College) by painting street scenes and architecturally interesting buildings and selling his work through private commissions. He has designed homes and presented them through his own architectural renderings in oil on canvas and pen and ink. His love of architecture has brought him to old historic towns, capturing their magic of place through his brush. He inhabits the places he paints always painting on location where possible (even if that location is the interior of his own imagination.) He now paints only in oil on linen canvas cloth, in what at first appears to be a highly representational or even meticulously detailed photorealistic style; but upon examination his work reveals itself as highly "impressionistic", subjective, idealized and even fantastic, a streetscape of the mind- of a bridge unbuilt, demolished or obscured. He is a photographer of the mind's eye, committing his vision to ground pigment, linseed oil, turpentine and linen cloth. The painter also produces fine art prints of his own work in archival pigmented inks on canvas cloth. Although limited in edition, numbered and signed by the painter, each canvas giclee print is in fact unique. Each one is hand embellished in oil paint. Although often described as a photorealist I reject the description of the style of my painting as photorealistic. I make no attempt to duplicate a photograph. Although there can be a valid artistic point in doing this, it is decidedly not my point. I attempt to communicate a reality or rather an illusion of actuality, as perceived by the eye and mind that is more intense, more concentrated than that which can be captured by the camera and lens alone. I also attempt a more honest portrayal of what is real than can be than produced by the simple photograph. Since many of my paintings are purely conceptual, existing originally only in the imagination, or as a distillation or manipulation of many separate scenes that may exist, did exist or I think existed, the charge of "merely" duplicating a photograph is particularly galling. By representing the finest detail in paint I attempt to foster the illusion, (or foist the illusion), to give a perceived concrete existence to a pure product of the interpretive imagination. The sometimes excruciating detail is fundamental to the intended impression, a sleight of hand (or eye), where we are perhaps distracted by the minutia, enamored of it and thus lulled into a forgetfulness that the whole is artifice, an elaborate construct that takes on a life entirely its own, an exaggerated reality so real that it seems dream-like, a dream more real than waking. Tom Jewusiak's oil paintings are currently on display at the Henegar Center for the Arts in Downtown Melbourne, at the Fredlund Gallery in Winter Park, Florida, a juried show at The Fifth Avenue Art Gallery in Historic Downtown Eau Gallie, and another juried show at the CityArts Factory hosted by Artists Registry in Orlando Florida.